CCTV cable is most commonly just a simple piece of RG59 coaxial cable that is ran between your security camera and DVR or any other video viewing devices. The RG59 coaxial cable type is the best choice cable type for video transmission in a surveillance application. CCTV cable is really the common term that encompasses the cable and its use. In order to make a CCTV cable you will need to terminate the RG59 cable with male BNC connectors on each end. Both your DVR (Digital Video Recorder) and security camera both come equipped with built in female BNC connectors to create the connection. The two most common types of BNC connectors used when building a CCTV cable are compression type and crimp type. Although both styles will create the connection you are trying to make, there are positives and negatives to each solution. 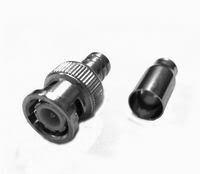 A crimp style BNC connector is the most cost effective solution for attaching a connector to your coaxial cable. The crimp mechanism of this BNC type uses a crimp tool to crush the metal sleeve of the connector in a way that it is attached to the coaxial cable. Although this type of solution gives you an inexpensive option, it is not known as the most durable, secure, or long lasting way to terminate cables. Since a crimp is essentially crushing a connector around a cable it leaves room for moisture to get in, which over time may cause connectivity issues. Also, over time the crimp begins to loosen and eventually the cable may disconnect from the connector. The end result of any poor connection will be poor video quality and eventual signal loss. This is why the majority of all CCTV cable and CCTV system issues are crimp connector related. 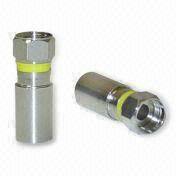 The compression BNC connector has become the most popular and long lasting solution to attach a connector to coaxial cable. The compression BNC connector offers a full 360 degree compression crimp that will ensure a durable and long lasting termination. Instead of crushing the metal to connect the connector to the cable like a crimp style, you are now compressing a sleeve that squeezes to the cable giving you a full circular connection. Although the compression style BNC connectors and termination tools are more expensive then the crimp style, they are the longer lasting, durable, and the most effective connector type used to block environmental conditions like wind, dust, and rain from effecting your cable connection. Making your own CCTV cables is a very simple task. You may go through a few connectors while learning but after a few practice terminations you will have a handle on it. There are numerous YouTube videos out there to teach you step by step how to terminate your own cables. You will have to just decide which style BNC connector set up is right for you. Both have their advantages and disadvantages. The tools you will need such as a termination tool and coaxial cable stripper are relatively inexpensive and will really last almost forever. Choose your coaxial cable termination system and start successfully terminating all your own cables. Good luck in installing your new surveillance system!